The formation of solidifi cation microstructures is one of the most important problems in materials science. These microstructures are a frozen trace, imprinted in the bulk solid, of interfacial patterns that form at the crystallization front, which are coupled with chemical diffusion in the liquid and stabilized by capillary effects. Their variability is an obstacle to a fi ne control of the properties of industrial materials. This nonequilibrium self-organization phenomenon raises complex issues on which the « Physical chemistry and dynamics of interfaces » team recently obtained conclusive results. With an original method for real-time observation of two-phase growth patterns in transparent alloys, they brought to light « weak » selection mechanisms by thermal forcing, located morphology stability limits, and discovered unexpected dynamics of topological defects. In directional solidifi cation (Fig. 1), the solid-liquid interface follows, in steady state, a fi xed, ideally planar isotherm on a large scale. During eutectic solidifi cation, simultaneous growth of two different crystalline phases (α et β) leads to the formation of regular αβ structures with a hexagonal or a banded arrangement, thus delivering rod-like or lamellar composite microstructures, respectively (Fig. 2), depending on the alloy and solidifi cation conditions. This dynamics is determined by solute diffusion between α et β crystals in the liquid on the scale of the interphase spacing λ, and by local interfacial equilibrium (surface tension). The theory shows the existence of periodic structures on a fi nite range of values of λ, at given solidifi cation rate V, which contains a characteristic value λJH proportional to V-1/2. The phenomenology of 1D periodic eutectic structures in thin samples is now well understood. In contrast, that of 2D eutectic morphologies in bulk samples remains ill-known, for both theoretical and experimental reasons. 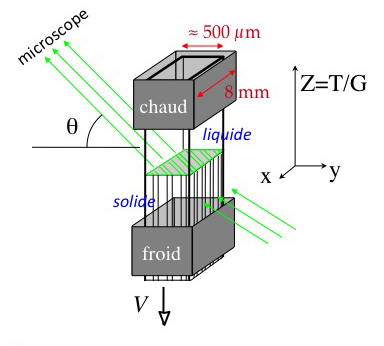 Crystallization of a liquid mixture at a constant speed V (0.01—1 μm/s) in a vertical temperature gradient (hot block at the top, to prevent thermal convection), ideally axial (isothermal plane normal to z). In situ observation of the solid-liquid interface with a long-distance optical microscope, in oblique view. An optimal setting (viewing and illumination angles, aperture), provides high-contrast images on micrometer scales. Lamellar eutectics. At the end of the initial stages of solidification, disordered « labyrinth » structures are observed (Fig. 3). How can one form a regular lamellar structure ? 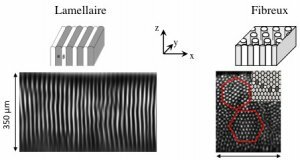 In practice, a thermal bias imposes a continual drift of the pattern toward one of the walls of the sample, and the progressive formation, from the opposite wall, of a periodic lamellar structure. Numerical simulations [phase field method ; M. Perrut et al, Acta Mater., 58, 1761 (2010)] confirm these observations. « Frozen » labyrinth pattern (axial gradient) and formation of a lamellar microstructure by a thermal-bias effect (schematic drawing). Insets : numerical simulations. Rod-like eutectics. Rod-like eutectic solidification patterns self-organize into hexagon domains separated by dynamic defect walls, which are regenerated throughout solidification (Fig. 2). Stable values of the interrod spacing fall in an interval (Fig. 4), the limits of which, estimated from average and local measurements, correspond to an elimination instability (lower threshold) and a branching instability (upper threshold). The branching threshold λbr follows the V-1/2 similarity law. The elimination threshold λel is smaller than λJH, and increases with V in a way consistent with a general relaxation process called « phase diffusion ». Stability diagram of rod-like eutectics. Rod branching event (horizontal dimension of each image : 65µm). During long-lasting experiments, the average value of the interrod spacing increases continuously. This is due to a « stretching » effect induced by a convex curvature of the isotherms, thus of the envelope of the solidification front, which originates from the difference of thermal conductivities of the solid, the liquid and the sample walls. After a long transient, the value of eventually saturates at a value close to the threshold λbr, when branching events compensate the stretching effect. The λ distribution is then stationary, and remarkably independent of the initial conditions. This dynamical marginal-selection process provides an explanation of standard observations in metallic alloys. This work, in close relationship with metallurgical themes, shows the crucial role of in situ solidification, the importance of the theoretical support of non-linear physics, and the parallel success of numerical simulations. They pave the way for the study of pending questions (incoherent oscillations, lamellar-rod bistability...). The European project (ESA/NASA, with financial support by CNES) of in situ solidification in microgravity « Transparent Alloys » [A. Ludwig, et al, JOM 64, 1097 (2012)] should enable the exploration of larger parameter ranges without thermosolutal convection. The apparatus (QinetiQ Space, Antwerp) is based on the method invented at INSP.